It all makes sense why the Bears lost 38-10 to the Minnesota Vikings in the season finale. It’s not like the Vikings outplayed them or were the better team, the 3-13 Bears just wanted to secure the third overall pick in the 2017 NFL Draft. How else do you explain the Vikings’ offense that was ranked 26th in the league in scoring (19.3 ppg) coming into this game – scoring 38 points? That was the most points by the Vikings this season. All the missed tackles, the five turnovers and empty trips in the red zone just reinforce the idea that the Bears wanted to be on the clock in Philadelphia before the Jaguars and Rams. Sadly, I honestly don’t think that was the case. 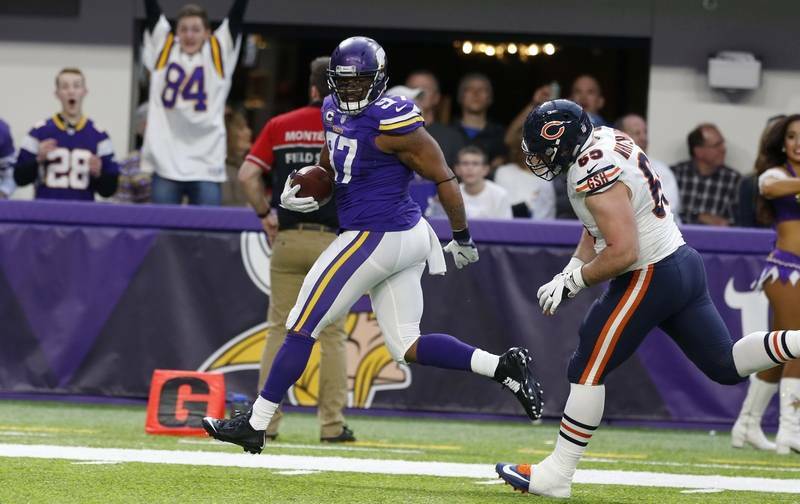 The Bears were flat out humiliated by the Vikings, who have been seeking revenge for that 20-10 loss on Halloween night. With the loss, the Bears went 0-8 on the road for the first time in franchise history. The 13 losses also tied a franchise record for the most losses in a season, which happened back in 1969. I get it, the Bears just like breaking records. Except these are records that should never be broken. There was a record broken that may have been overlooked due to the pathetic play of the Bears and that was Jordan Howard breaking Matt Forte’s rookie rushing record. Howard ended his fantastic season with 1,313 rushing yards and averaged 5.2 yards per carry. Other than Howard the highlight of this game was a trick play that ended with Cameron Meredith throwing a touchdown to Matt Barkley. That one pass from Meredith was arguably the best throw from a Bear that we have seen all season. Meredith ended the season with the best completion percentage, 100 percent. The season just ended, but the question is already in play: Who will the Bears select with the third overall pick? This team has plenty of holes to fill and could honestly go in any direction. A player in the secondary who can create turnovers is an option, an athletic defense end who can play the run and rush the quarterback is another alternative or possibly a new face of the franchise at quarterback. So many possibilities and only one shot to select the right player. Here are the Bears last five first round picks prior to this season: Kevin White, Kyle Fuller, Kyle Long, Shea McClellin, and Gabe Carimi. The Bears sure do know how to pick’em don’t they? It’s not an easy task when it comes to selecting a first round talent, but it makes sense why the Bears have missed the playoffs 9 out of the last 10 years. For the most part, the first round talents have not contributed to the foundation to a degree that allows a rebuild to become successful. Whoever is the third overall pick for the Bears will be a crucial one if they want to one day make it back to the playoffs and more importantly the Super Bowl. But, that seems like it is years down the line. Here is an interesting comment from Alshon Jeffery following the game. There you have it, Jeffery, who had one reception for 10 yards in what might have been his last game as a Bear, guaranteed a Super Bowl victory next season. Well, we will see how that prediction pans out, but personally … I think that can’t be further from the truth. The 2016 season is over and now the Bears are officially on the clock. Did you miss our Week 17 Postgame Show?